Born on Christmas Day, December 25, 1923 to Mrs. Mary Blackmar Drake and Mr. Archie Drake, Jr., Archelaus “Archie” Augustus Drake, III, was a native of Macon, Georgia. He entered The Citadel at Charleston, South Carolina with the Class of 1946 at the beginning of the 1941-42 academic year. His Sophomore year, he was a Cadet Corporal and a member of Cadet Company “O”. In December that year, he like many of his classmates, enlisted in the U.S. Army. He officially entered the service after the academic year ended, and after basic training, the army sent him to their Army Specialized Training Program (ASTP) at the University of Nebraska. He was assigned to 4th Platoon Company C. Two of his Citadel classmates were with him in the platoon – Lee Masters of Charleston, S.C., and Osborne M. Bounds of Washington, Georgia. In Europe, he was a Sergeant assigned to “L” Company, 324th Infantry Regiment, 44th Infantry Division, Seventh Army. On December 5, 1944, he was fighting at Ratzwiller, Bas-Rhin, France when he was killed in action. Following the war, Sgt. Drake’s body was repatriated. Sgt. Archie A. Drake now rests in eternal peace at Riverside Cemetery, Macon, Georgia. In his memory, the “Archie Drake Prize”, a student achievement award, was created at Emory College at Atlanta, Georgia through the support of Mr. and Mrs. William L. Matheson. Archie had been a boyhood friend of William. The prize is awarded annually to an Emory College junior who displays remarkable growth in academic and leadership promise. There is also a sword on display in the Emory library that belonged to the family. 1943 Sphinx, Year book of the South Carolina Corps of Cadets, Charleston, S.C.
1944 Cornhusker, Year book of the University of Nebraska, Lincoln – Volume 28. Combat history of the 324th Infantry Regiment. This entry was posted on December 5, 2015 by Roger Long. 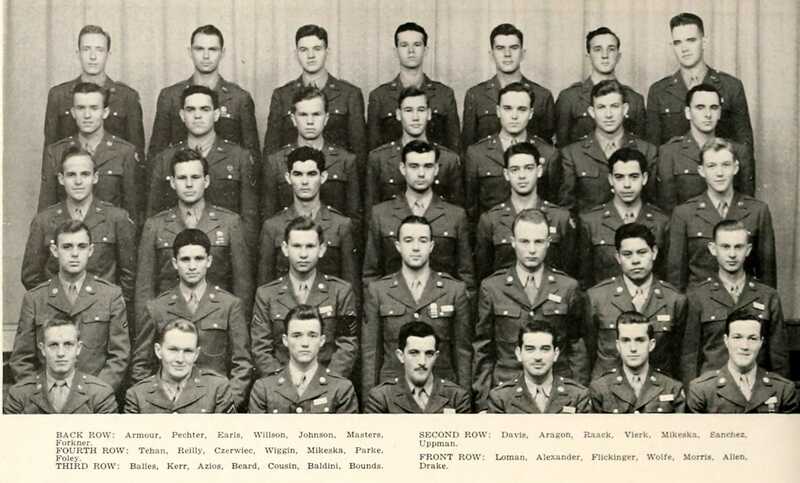 It was filed under Repatriated, Uncategorized and was tagged with 324th Infantry Regiment, 44th Infantry Division, 7th U.S. Army, ASTP, Class of 1945, Cornhuskers, georgia, History, Macon, Ratzwiller, The Citadel, University of Nebraska, WWII.